2/20/2017 – Although round three saw the vast majority of the games end in draws, the wild battle between Hikaru Nakamura and Richard Rapport left few doubts any such thing would happen to their game. After a QGD Chigorin, Rapport castled queenside, and the gloves were off! MVL continues sole leader. Illustrated report with analysis by Alex Yermolinsky. Alexander Riazantsev emerged from the opening white against Li Chao with a small but tangible advantage, but preferred to call it a day at move 20 with all the pieces still on the board. Pity. On the other hand, there was nothing peace-loving about Jon Hammer's game against Ding Liren. The two played an excellent game, each giving up the exchange (Hammer was first), until they had exhausted all the possibilities. ... his shoes certainly stood out! 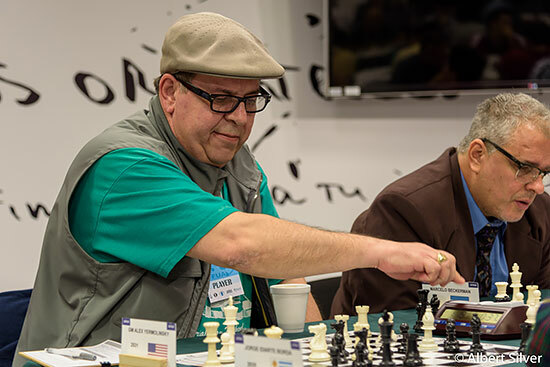 Pavel Eljanov had a wild game against Michael Adams. He started well with a nice bind and good attacking prospects against White's king on the queenside, but seemed a bit gun-shy refusing to commit to an attack. The position turned and he soon was utterly lost. However, right before the time control, Adams blundered his advantage away and they drew. Getting used to the new layout and enjoying it in general! One question: do we not have standings for this tournament, or am I just unable to see them due to a browser issue or something? Nice article and analysis on what has turned out to be a good tournament so far. And kudos to ChessBase on the new design of the site, it's real nice. Good professional looking site. Good job! New Design is Awesome. But font is little small, It will be better if you improve font size. Love the new layout. There is no awkward scrolls, just make the fonts a little bigger. I love the new look...great job!!! Yes, the website design is more pleasant, although it still needs a few tweaks. More importantly, however, the annoying Chessbase Download pop-up has been removed for the sake of quality of user experience. In the display of moves in Adams-Pavel, after 3.. g6 we see "(06)". After 11. Ng4 we see "(00:06)". What are the different meanings between these two different displays of 'six'? Layout looks worse than the previous and the font is too small. Good design! Elegant font. Analysis can be deeper in some positional and tactical games. The idea of this new layout is wonderfull....great job Chessbase.com ! !